The Book – Where Can I Find Wifi? Have you ever wanted to travel the world, working from your laptop on beaches and mountaintops, but felt like no one understands your unique, manly, needs? 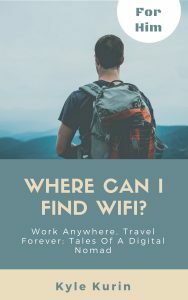 In this brand new version of Where Can I Find Wifi, the author, who definitely understands the challenges of the modern man, outlines how you can travel the world indefinitely while working online. The correct phrases to say when you’ve made even the smallest amount of progress with your online business (I’m killing it! This is awesome! I make money in my sleep!). How to make friends on the road and keep in touch with your friends back home – no homo. How you can apply your skills and experience to an online career. No skills or experience? In the for him version, that’s not a problem! Just act more qualified than you are and people will listen to you! Reviews of Where Can I Find WIfi?